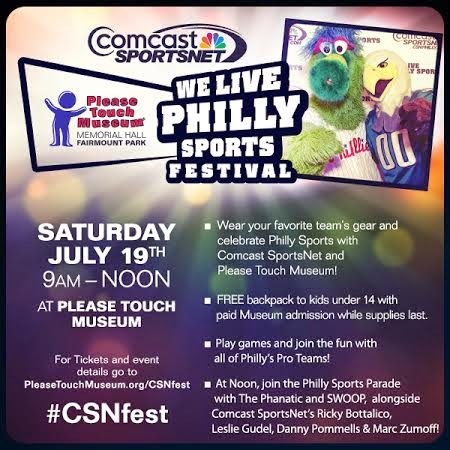 Comcast SportsNet's signature fan event- the We Live Philly Sports Festival- will be held Saturday, July 19th, 2014 from 9am-12noon at the Please Touch Museum. Come celebrate Philly Sports with the Philadelphia Eagles, Phillies, Sixers, Flyers and Union. Show your team spirit, wear your favorite team's gear, and join in on a sports-filled day of fun! In addition to the Please Touch Museum's great interactive exhibits, our team partners will be providing fun activities and special appearances by our favorite mascots and Comcast SportsNet personalities. Free backpacks will be available for kids under 14 with paid Museum admission while supplies last. For ticket information, click on the following link and enter promo code: CSNfest prior to check out and receive $2.00 off of up to four (4) general admission tickets. Discount is available online only and may not be combined with any other offer. Tickets are good for a year from date to purchase.